There’s been this narrative about Pau Gasol, a sort of don’t confuse me with the facts thing that he is a tentative player, someone who fades from the fight, soft in the detractive vernacular of professional sports. This, of course, for the second leading man on a two-time champion team. You know: Are you going to believe what you see or what I tell you? “A lot of bull crap stuff,” Taj Gibson was saying Wednesday night after Gasol came up strong and big once again with 22 points and 14 rebounds in the Bulls’ second consecutive comeback win, 95-86 over the Milwaukee Bucks. Tuesday at the United Center, Gasol had 16 points and 13 rebounds as the Bulls rallied from 10 points behind without Joakim Noah as Gasol played 41 minutes. Then Wednesday, again without an ill Noah and in the second of the back to back against an active and long Bucks front line, Gasol was the rock in 36 minutes, leading the Bulls in fourth quarter rebounding. Gasol has been that and more and everything that was promised, leading the team in minutes played, total points, rebounds and blocks while averaging 18.8 points, 10.6 rebounds and 2.6 blocks. Though the Bulls were outrebounded again Wednesday, Gasol was the leading rebounder among both teams in the fourth quarter, adding a crucial jumper when the Bulls led 79-78 with 5:12 remaining and then two clinching free throws when he grabbed a Bucks air ball and was fouled with 1:39 remaining. “I thought Pau late in the game, it seemed like he got to every rebound,” said Bulls coach Tom Thibodeau as the Bulls went to 4-1. “That’s huge. Not giving them a second and third crack. Oftentimes, that’s when you see the threes. The long shot, long rebound and kick out. Pau was range rebounding. He was covering a lot of ground to get to them. He had people hanging on him; he was strong. So that’s big. He’s smart and he’s long; it seems he’s a better rebounder late. With the game on the line, he’s going after it. He reads the ball well, anticipates, knows who’s shooting it. It’s one of his strengths. It was especially important for the victory Wednesday as the Bulls bench players never got much going, outscored by Milwaukee’s reserves 50-11. Though Kirk Hinrich made two crucial three pointers in the fourth quarter. So the starters carried the night without Noah, whom the Bulls hope will play Friday in Philadelphia. They’re also hoping Derrick Rose can play as well as Rose returned to the lineup Wednesday after missing two games with a sprained ankle, clearly not fully healed but doing enough with 13 points and seven assists to make a difference. As always with Rose and injuries, there is a heightened alert, even for a common basketball injury like an ankle sprain. Rose was again listed a game time decision, but he said he was determined to play even as he clearly was running stiffly, especially early in the game. He went almost 32 minutes without much lift, but drawing enough defensive attention and with several runners and going to the basket late in the game to hold off the Bucks with free throws. “I wasn’t 100 percent,” Rose acknowledged. “I felt like we needed a win and just tried to come out and get the win with my teammates. Really couldn’t get to hole as much as I wanted. No fast break points or anything, but I was still able to affect the game and draw people in with my double teams to help my teammates out. But Rose clearly was limited early. He made a pair of three pointers, though the Bucks began to go at him on defense and apparently Bucks guard Brandon Knight began to taunt Rose late in the second quarter with the Bucks leading 46-37. Rose later said he couldn’t recall what was said, but his ankle seemed to loosen up then as he led on a Bulls 12-7 run to end the half with a driving score, nifty passes to Gasol for a slam dunk and Mike Dunleavy for a three and then a powerful finishing basket of his own that changed the tenor of the game. It enabled the Bulls to trail 53-49 at halftime in a game the Bucks seemed to be dominating. “Just basketball, competing,” shrugged Rose. “I forgot what he did to get under my skin. It’s something that just had me going. We’ll see next time. “Starting it was kind of stiff,” Rose admitted. “I wasn’t worried offensively; we are good offensively. Before the game, I told Thibs I was worried about defense moving around. Defense you have to react, especially against the point guards they have. End of the first half, that’s when I (was able) to compete more like myself. Rose then was asked his regular question that’s some form of when did you stop being a quitter. With his history of two years with knee operations, Rose—and he does it with remarkable calm—basically has to respond almost every game to some question about being criticized on talk radio or in the newspapers or on TV about being injured. To his credit, Rose never gets angry or answers with anything but professional aplomb. 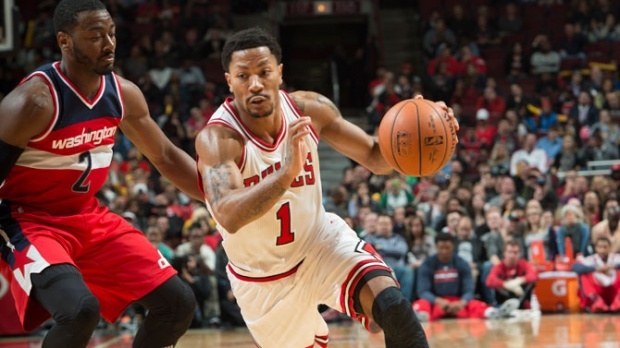 “Chicago is a hard place to play, I know that,” said Rose. “They just want to see good basketball. They’re just good basketball fans so I can’t get mad. It’s a worthy enough goal with the Bulls off to a good start, tied atop the Eastern Conference in a tough part of the schedule with 12 of the first 17 on the road. The Bulls finish the current four in five days with Philadelphia and Boston home Saturday and then see Detroit, Toronto and Indiana next week before going to the Western Conference. So it’s important to get a cushion of wins, which hasn’t been assured even against non playoff teams with the regular starting group not having played together yet. Friday in Philadelphia could be the first time, though Rose won’t be at full health and likely not Noah after a rough go with flu. The Bulls trailed 23-21 after the first quarter as Chicagoan Jabari Parker had six points and four rebounds. But it wasn’t a good game for the celebrated rookie from Simeon High School and Duke, who ended with eight points on four of 12 shooting. As advertised, he seems to have a good feel for the game. But’s he’s not a particularly athletic player and doesn’t much make plays for himself. The Bucks have wild guards with Brandon Knight and Jerryd Bayless and don’t run much to set up Parker under inexperienced coach Jason Kidd. Knight was the only starter to score in double figures with 10 points, and he shot three of 15. It’s an athletic Bucks team that pushes the ball, though often out of control. Once the Bulls settled in and got more physical, the Bucks scored just 33 points in the second half. The Bucks had been the aggressors in the first half, getting 14 free throws to six for the Bulls and seemed about to take over until that Rose awakening that was the start of it being a bad Knight for the Bucks. Rookie Nikola Mirotic had a rough game shooting one of six and unable to contain Giannis Antetokounmpo, who led Milwaukee with 13 points. One blind spot was the Bulls constantly missing Doug McDermott. He only played about seven minutes, but was routinely open as the Bucks curiously played well off him. But the second group seemed to rarely find him as he never got a field goal attempt. But the Bulls got it going to start the third to finish that second quarter run with Rose getting a steal and finding Dunleavy for a fast break score. That highlighted a 13-2 run to start the third quarter and 25-9 since late in the first half to take a 62-55 lead. The Bucks did get back within 72-70 going into the fourth quarter as their dribbling out of control guards made some plays while Gasol answered with 10 points with a runout dunk and a driving three-point play in which he pumped his fists as he’s often done with the Bulls, much more emotional and animated than advertised. And then in the fourth quarter the Bulls said goodbye to the Bucks with the highlights another Butler steal among his four, a spectacular acrobatic layup for Butler, who had 14 points, seven assists, six rebounds and four steals and earlier in the day picked up his diploma at Marquette as he does continue to do it all. Hinrich had the two threes, one on a terrific Butler assist. And Brooks and Hinrich drew driving killing offensive fouls as the Bulls delivered the knockout. How’s that go: Pow!